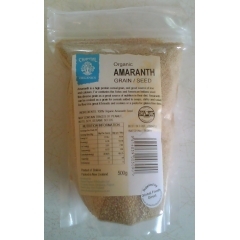 Chantal Organics Amaranth Grain/Seed. 500gm. Home > Pasta/Rice/Grains > Chantal Organics Amaranth Grain/Seed. 500gm. Amaranth is a high protein cereal grain, and good source of iron and calcium. For centuries the Aztec and American Indians used this diverse grain as a great source of nutrition in their diet. Amaranth can be cooked as a grain for cereals, added to soups, stirfrys and salads. As flour it is great in breads and cookies or a pasta for gluten free diets. Product of Bolivia. Packed in New Zealand.